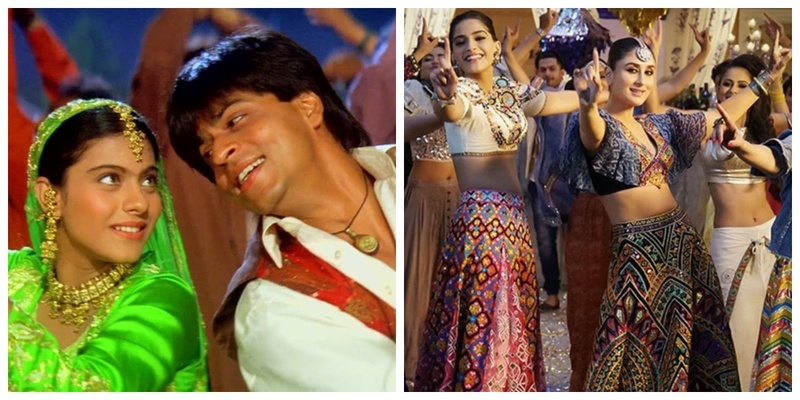 50 Hindi wedding songs to play at your upcoming Indian Wedding! Wedding songs are the heart and soul of every Indian wedding. After all, what’s a shaadi without some naach gaana, right? Right from mehndi to vidaai, all the ceremonies and celebrations call for some kind of wedding music to be played. And if you are contemplating to download a playlist to blast on loudspeakers, then check out this Hindi wedding songs list that’s an all-time classic! If you are a 90s kid getting married now, you cannot not play this wedding song for your mehndi! Oh, the charm with which SRK danced to this wanted all of us to get married! This wedding song is a classic A.R. Rehman that is the perfect tease song to play for the bride. Let’s admit that when this movie came out, we all choreographed one dance with our girl gang on this wedding song! Why not do the same again? Just the wedding song your fam jam needs to dance on the sangeet night! Queen has given goals to every modern woman in more ways than one! One of them is to definitely shake a leg on London Thumakda on your mehndi! This is the perfect wedding song for the mother-of-the-bride and other massi’s and bua’s to dance on the sangeet or haldi. Originally a folk song from Chattisgarh, this wedding song was made popular by the movie Delhi - 6. Fun Fact: The song is called Sasural Genda Phool because genda phool is a metaphor used to describe the in-laws home! Different relations in the bride’s sasural are like different petals of genda phool. :) Bet you didn’t know this! While this wedding song is absolutely sad, it is a great option to play at vidaai. Just some proverbial ghee in the fire of tears! Sajanji ghar aye is the perfect wedding dance song to welcome the dulha and his baarat! Bumbro is the perfect wedding song for little girls in the family to have a choreographed dance on the sangeet night! Yet another wedding song for the bride and her girls to thumka on! Tune Maari Entriyaan is just the perfect wedding song for the bride’s entry and the groom to dance on while he awaits his soon-to-be-wife! This 90s remix of Aankh Marey comes in the latest wedding songs chartbuster that’s going to rule all weddings in 2019! Learn the steps already, you guys! Kabira is a soulful and happy wedding song that can be played during the bride’s haldi or mehndi ceremony! ‘Mudke na dekho Dilbaro’ is a heartwarming and poignant new wedding song that is ideal to play for the bride’s viddai. Radha teri chunri is that one song from SOTY that none of us can forget. Just the fun, peppy and happy wedding song you need to play for the bride and her bridesmaids to dance on! Got a bride who has decided to remain talli through her wedding functions? This is the perfect wedding song for the ‘ghani bawri’ bride to show off her moves! Need a wedding song for the fam to groove on? Gallan Goodiya is your pick! This wedding song can be for the bride’s solo performance on the sangeet night! Bonus points to the bride who can match the charm and dance steps of Jacqueline! Pehli Nazar Me Kaisa Jadoo Kar Diya is a soulful and romantic wedding song that can be played for a couple dance or just in the for the reception! This old classic is the perfect happy wedding song to play during vidaai. Need to break the rivers of tears with something peppy, right? Technically a proposal song, this one can be played for an engagement or roka party for the groom and bride to dance together! Yet another wedding song for the entire extended family to dance on! Sapne me milti hai kudi meri is the cutest 90s wedding song that the groom can play for the bride and dance to on the sangeet evening or as the bride gets her mehndi done! The holy grail wedding song of Bollywood for sangeet nights, Batameez Dil is sure to get the entire crowd going batameez after a few drinks! Probably the wedding song of the century, Didi tera devar has blasted at enough weddings to legit receive the veteran wedding song award! Dillwala people swear by this wedding anthem! Play it at your sangeet and watch each one of your guests show their best moves! O Mummy Mummy is such a 90s classic! Perfect wedding song for the groom to dance solo! If you are a couple that likes to have fun and want to ditch the cheesy romantic wedding songs, then Yeh raat aur yeh duri is just the couple dance song you’re looking for! This tapori dance number of the 90s is just the wedding song you need to blast on the DJ when everyone is drunk and dancing like there’s no tomorrow. Chalka re from Saathiya has had us crooning and grooving since we were 8. Get your girl gang to set up a dance on this and perform while the bride gets her mehndi done! After all, the dulhan needs some entertainment while she breaks her back getting her mehndi done for 6 hours straight. This modern spin by Nucleya on a classic Punjabi song is all that shaadi wala ghar needed to shake-it and move-it! While it is next to impossible to match Katrina’s killer abs in this wedding song, the least you can do is copy her steps and perform this peppy number on your cousin’s or friend’s sangeet! Yet another cute and offbeat wedding song the groom can dance to for his bride! Din Shagna Da is a simple yet soulful wedding song that you can just play in the background during the bride’s mehndi or haldi ceremony. Is there a more perfect wedding song to welcome the baarat with swag? Rajashri has given Bollywood more wedding songs than all of Alok Nath’s Aashirwaad’s put together! Chote Chote Bhaiyon Ke Bade Bhaiya is a great song for younger cousins and baccha party to perform at an elder bro’s wedding! If you and your bride tribe are as dramatic as Anjali in K3G, then this wedding song should top your list for performing on the sangeet! Enna Sona is a sweet and romantic wedding song that the couple can have their first dance on! If it is your veere di wedding, you got to pick this wedding song to shake a leg at the cocktail party! Can we file a petition to make vidaais happier? Play wedding songs like these and let’s test the groom’s strength in lifting the bride as she says bye-bye to her family! Fun, groovy and peppy wedding dance song for the couple who likes to keep it quirky! Pick the original Humma Humma if you’re a purist like me! Do the bride and groom have a lot of common friends? Well, this song is perfect for the boys and the groom to set up a dance for the bride! Yeah, I know this is not a Hindi wedding song. But can we please give Zingat the tag of the forever classic “daru peeke nachne wala gana”? Please tell me that you downloaded all these wedding songs and can’t wait to choreograph dances on them!